Sitting on a porch with a glass of lemonade during a gentle summer rain. Slipping into a bed after just drying the sheets so you are a warm burrito person. Watching the Reds down the Marlins with the ease and grace of rollerblader on a summer Saturday, dancing through their cones. Just some simple pleasures of life. The Marlins sure are good for what ails ya. 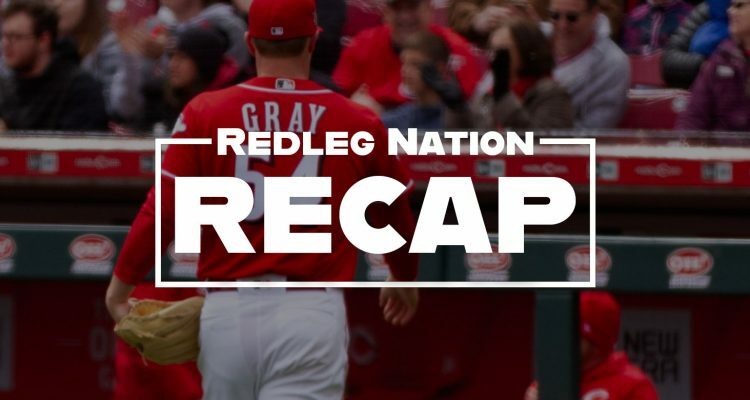 Sonny Gray continued the Reds pitching revolution today, tossing 4.0 innings of shutout baseball. He left after the fourth presumably as a result of taking a comebacker off the knee in the second. 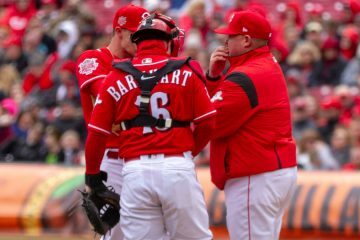 With those four innings, the Reds starters have allowed a single earned run across 16 innings against the Marlins, with 21 strikeouts. The days of “this pitching stinks” feel long gone. The bats, especially the top of the order, have finally come alive. Jesse Winker singled and walked twice, scoring twice as well. Nothing quite like the Marlins for some slump-busting. Joey Votto picked up a couple hits, including an RBI single, beating the shift, in the fifth. That single took the Exit Velocity crown of the day, coming off Votto’s bat at 104+ mph. Yasiel Puig took a man-killing hack on a 3-0 count in the fifth, ultimately coming up empty. Two pitches later, with a full count, Puig sticks his bat out for a defensive swing and doubles down the left field line, bringing home two. A master class of swinging for the count and still staying productive. Eugenio Suarez opened the scoring for the Reds, singling home Jesse Winker in the fourth. That run came as a result of the Reds lineup working to maximum efficiency. Winker and Votto both getting on base, Puig or Suarez bringing them around. In the bottom of the eighth, Suarez hit the sneakiest of solo home runs. The ball just barely cleared the wall, right at the base of the foul pole. In the baseball version of HORSE, that’s the halfcourt, over-the-head, eyes-closed game winner. Lower down in the order, Curt Casali continues to prove he’s a professional hitter. Another couple singles with one of them coming off the bat at 96.2 mph plus a double right down the line in the bottom of the eighth. Casali has a lot of strength in his bat and makes for a great complement to Tucker Barnhart. Even more so than the Reds rotation this series, the Reds bullpen has been nails. Robert Stephenson pitched a clean fifth after Sonny Gray exited, continuing his completely remade performance from the Bob Steve we’ve come to know. Zach Duke got out of a rocky sixth with some more defensive wizardry from Jose Iglesias, and David Hernandez got through two scoreless frames. Wandy Peralta allowed a hit and a walk, but preserved the shut with a scoreless ninth. Obviously Sonny Gray’s early exit takes the bad news of the day. But the Reds Twitter posted that he left only with a left leg contusion, which is really just a fancy word for bruise. As long as nothing inside the leg is broken or fractured, I don’t think Gray will miss many, if any, starts. In the top of the first, Yasiel Puig briefly looked to make a circus catch in foul territory at the wall, but upon closer review, it more resembled a juggling act. By the rules of NFL Street 2, that’s not only a catch, but the Reds get two runs. Don’t blame me, those the rules. In the fifth, Casali tagged at first on a Jose Iglesias flyball to deep center. It was an incredibly heads up play, and Casali ended up scoring on Votto’s single through the six hole. He would’ve been on second anyway after the Winker walk, but still, the Reds are being aggressive on the basepaths this year and in that instance, it showed some savvy. The Reds travel to Monterrey, Mexico to take on the St. Louis Cardinals in an international set. The two-game series starts Saturday at 7:10 EST with live video on Fox Sports Ohio and radio at WLW 700. Tanner Roark takes on Adam Wainwright in the Saturday game. Yeah Reds! We really needed the Marlins this week. A great sweep, we are out of last place. Yep, my only quibble about the game was pinch hitting for Stephenson in the 5th. He was nails, throwing 3 straight changeups for strikes. I’d rather him bat. At worst Winker bats with a runner in scoring position and 2 outs. In that moment I think run prevention was more important. As I recall, they had a runner on 2nd and one out when stephenson spot came up. The lead was only one run at that point, so its a good time to see if you can add-on to that. Hooray for NL baseball? Buzz. The Old Cossack is completely on board regarding keeping Stephenson in the game for an extended outing opportunity. When DB pulled Gray after 4 innings and brought Stephenson in from the bullpen, I really thought we would see Stephenson get a shot at pitching at least 3 innings. I thought that was a perfect opportunity for a double switch involving either Kemp or Peraza, rather than simply replacing the starting pitcher with the pitchers slot due up 3rd in the bottom of the inning. It’s time to take the blinders off and remove the safety net for Stephenson and see what he can do. I really think he will have a key opportunity in the 2020 starting rotation and there’s no better time to begin finding out what he can do in extended outings when the opportunity becomes available…like today. Imagine what a starting rotation would look like, headed by Castillo and Stephenson with both pitchers performing at full potential. That would be scary good…and cheap! I thought the same thing, then also realized that others in the bullpen need enough work to be staying or getting sharp, as well. With an off day tomorrow and very little work for the pen since last weekend, getting some innings for others helps the team overall. Long time reader, but I rarely post. Looking to engage a little more with this community. I will have to respectfully disagree, with The Old Cossack and Sultan. Given his history, I love what the Reds are doing with Stephenson. He started at the bottom. He pitched well. Gave him a high leverage inning today. He pitched well. Slowly working him up the ladder seems appropriate. There is also the fact that with the starters pitching so effectively, some of the bullpen guys need a little work before going to Mexico and facing a much more talented Cardinals team. I agree with the move. I also began to dream about a 2020 starting staff headlined by Castillo and Stephenson. When you add Mahle and Sonny Gray, that is a staff that can be strong at the top end and very deep with #2 and #3 quality guys at the 3 & 4 spots. Santillian could be knocking on the door by then as well. Stephenson/Lorenzen/Disco with the preference of Disco being dealt away this year. The thing with Garett is that it’s not the team stopping him from starting. It’s him. He doesn’t want to start. Prefers the adrenaline of pitching in high-stress relief situation. I would say, at least wait and see what Wood can do when he is healthy. The less he pitches the more likely he would be inclined for a pillow contract. Indy Red – I completely forgot about Disco…. If he is healthy and he’s your #5, that’s pretty good. At this point, it looks like Stephenson is the more likely candidate for the rotation. Garrett like the bullpen. Stephenson is too talented to not get a shot. It would still be a high quality problem to have! It all starts with good starting pitching, and it was outstanding in this series. It allows a team to win those 2 run, 3 hit games like last night. Shutouts are nice, even if it is against the Marlins. Winker is about to catch on fire at the plate. Suarez is smoldering. Another big win and more good pitching. A big two game series coming up and then off to the Left Coast. Only 11,000 and change in attendance on an absolutely perfect day weather wise. I took work off and drove my family down and it was in the running for best game I’ve been to. My daughter is just old enough to understand what was happening, and my wife was grateful for the impromptu family outing. I don’t think I can remember seeing them both as happy as they were at the ballpark. Seeing a W was all the more sweet. I assume 11000 was the announced attendance, but how many people were actually there? On tv, it looked like the place was nearly empty. It may matter little for revenue, but it sure looks bad and embarrassing. Just wondering — when was the last time a Reds pitching staff gave up only one run over the course of 30 consecutive innings (27 vs. Miami, three in series finale in Pittsburgh)? Not sure, but I think some Daemons are shoveling some snow today. The off day helps tomorrow. Calf bruises sometimes can be tricky. The next schedule start for Sonny Gray would be the 5th game of the road trip, which is the last game of the Dodgers series next Wednesday. That game is scheduled for a 3:10PM (EDT) start. Thursday’s game at SD is schedule for a 10:10PM start. Would the Reds be smart to bump Gray back a start?? It would be giving him almost an extra day and a half to give his calf time to heal. He already gets an extra day with the day off tomorrow. Tacking on an extra day (and a half) at the end would give him a week in between starts. Early in the season that might be good. Gray doesn’t need a lingering calf issues. No pitcher does. That’s probably why he was removed to day after 4. If it started to be a problem just pull him and start getting it treated in the clubhouse. Thom(!) and Brantley talked for half an inning about whether or not Gray should get on the team plane or not with the swelling. Thom(!) always makes me grateful for radio. But hey, free game of the day. I did not see the play but listened and Marty abd Danny Graves on radio and bith were like WOW when seeing replay… It took awhile to deterimine if gray was going to stay…. 3 warm up pitches and still more time. Kudos to gray fir coming back and pitching strong but yes….an extra day or 2 in April is nothing. This is a huge road trip. 3-6 and back to Sunday… 5-4 and making progress. WInker has improved his offense dramatically simply by doing what he’s been doing since the season began and trusting the process. His Isolated OBP is now up to 0.109. His Isolated SLG is now up to 0.177. If his AVG improves to just 100 points to .250 (which it certainly will), Winker will slashing .250/.359/.427 and on his way to a spectacular season. Winker started 4 games in a row and got 17 plate appearances since Sunday. That, more than anything got him going. He’s either a core part of your offense, or he’s not. The Puig suspension gave reps and certainty and Bell off the hot seat. The news on Senzel today suggests it’s another month before he is making his debut. Winker needs to play everyday. Puig needs to play everyday. Can Bell make Kemp a 4 th OF and power bat off the bench now that Puig is back? I agree 100%.Winker is an everyday guy and has been in the minors.I understand playing Kemp but the reality is his salary and age will bring little or nothing in a trade at the deadline. I was shocked at how well he did in CF today. Our outfield defense has been atrocious. It was nice to hear Cowboy talk about how one of the Reds players took him to task about how little time he put into his defense. Even better to hear Wink took the criticism to heart and started putting in the time. The Doom and Gloom of the past week is rapidly being muted and quashed. The Reds hitters are now sporting a quaint little OPS of .656. That in and of itself is certainly not earth-shattering, but that now places the Reds 12th of 15 NL teams, up from dead last. The Reds pitchers are now sporting a flashy ERA of 2.82. That is earth-shattering and places the Reds 1st of 15 NL teams. Yes, the Reds are leading the entire league. The team is also just 3.5 games out of 1st place in the NLCD and only 3 losses behind the leaders. Billy Hamilton injured and carted off. Lost in a nice win for the good guys was a baserunning risk by Winker. He went from 1st to 3rd on a basehit with 2 outs and came within an eyelash of getting thrown out at 3rd base before Casali could score from 2nd. Moving from 2nd to 3rd with 2 outs is an unneccessary risk for a slow guy like Winker. A big part of what made the Scott Rolen era Reds so effective was their smart baserunning. No when to take a calculated risk. Winker’s today was more of a Suarez/Votto adventure that got lucky. Teachable moment though if Bell is on the job? With the shift on, the SS was out of position and the 3rd baseman was acting as cut off man down the line, leaving 3rd base unprotected…for a moment. But it was close for sure. Not sure if he was waved into third or went on his own. Reds win the battle of last place teams convincingly. Hopefully the momentum continues against the Cards. Puig being Puig stealing third barely with two outs was worse. Nice sweep to get the Reds back in the swing of things. Couldn’t have asked for better timing than to have Miami come to town after a 1-8 start. Things looking on the up and up but Reds have a tough Redbirds team coming into town Saturday (What?). Much rather be playing them at 4-8 than 2-10. Maybe we can get on a good roll now. I’m a little wary of reading too much into small sample sizes, but Robert Stephenson was always regarded as having some of the best stuff, if not the best stuff, in the whole organization. His problem always was about control and, by extension, coachability. If things have suddenly “clicked” for him where he’ll listen to coaches and realize that walking people is actually bad, then the Reds could have another ace in waiting to challenge Castillo for the future. Between those two, they could be two of the better young pitchers going forward. Again, I’m not trying to presume too much after just 6 innings of work, but it’s hard not to get excited by the possibility. I wrote off Bob Steve awhile ago as a million dollar arm with a ten cent head. But from watching him so far this spring, he looks like a different guy out there, someone who is finally ready to make “The Leap”. Hopefully, they start letting him go multiple innings out of the ‘pen and stretch him out some, and maybe give him some spot starts here and there. Let’s see if this change is real, and if it is, game on. One cause for optimism with Stephenson: his sample size is small, yes, but his 6 innings are not the same as if he’d had one good day and one good six inning start. He’s pitched in several games and looked good in all of them. That’s not a trivial detail in my book. I’m cautiously optimistic. The Reds have taken up temporary residence in Monterey Mexico, fresh off a 3-game sweep of the Fish, for a 2-game showdown against the dirty birds. 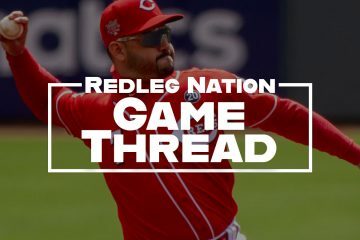 For a team coming off an 8-game skid during the 1st 2 weeks of the season, the Reds suddenly don’t look like the pushovers of the NLCD or possibly even the NL. The only issue for the 2-game series against the dirty birds in Monterey is the starting pitching rotation. The Reds have Roark and DeSclafani, their 5th & 4th best starters) scheduled to take the mound in Mexico. They will need to bring their ‘A’ game for an international showing. The Reds will quickly become a team no one wants to play. The Brew Crew should be counting their blessings that they faced the Reds early, when they got away with some cheap wins.